We propose a technique to detect lateral misalignment of Laguerre Gaussian(LG) beams via spatial mode projection. We analytically solve the intensity of the misaligned beam projected on two different basis beams--a Gaussian beam and an aligned LG beam with the same topological charge l. We verify the analytical calculations by doing numerical simulations. Results show that the probability amplitudes follow a quadratic behavior for the Gaussian basis beam and a quartic trend for the LG basis beam with respect to increasing lateral misalignment. This study can be applied in determining minute beam displacements such as beamshift measurements. N. A. Zambale and N. Hermosa. 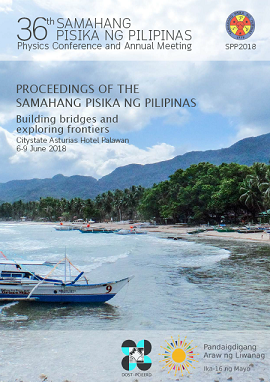 Detecting lateral misalignment of Laguerre Gaussian beams via spatial mode projection, Proceedings of the Samahang Pisika ng Pilipinas 36, SPP-2018-PA-39 (2018). URL: https://paperview.spp-online.org/proceedings/article/view/SPP-2018-PA-39.